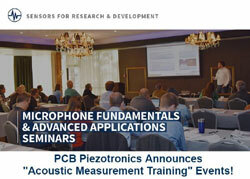 HomeAll articlesAcoustic propertiesSeries of Acoustic Measurement Training Events Announced by PCB Piezotronics, Inc.
Series of Acoustic Measurement Training Events Announced by PCB Piezotronics, Inc.
PCB Piezotronics, Inc. announces the 2017 schedule of educational seminars and webinars including the popular "Microphone & Acoustic Fundamentals and Advanced Applications" training in various locations across the United States. Registration is open for these seminars along with the first in a series of webinars. These educational events include interactive lectures, demonstrations and hands-on activities. "We learned helpful hints, observed techniques, and gained insights into equipment and software tools that will be beneficial in solving our technical acoustic challenges," states an engineer from the Aerospace Industry. "This seminar answered several of the specific technical questions that I have had for years", said another attendee. An "Advanced Acoustics" webinar is scheduled for January 12th and will be followed by additional monthly webinars covering a variety of sound and vibration topics. The instructors for these seminars are Andrew Barnard, Ph.D. and Michael Thibeault. Dr. Barnard is an Assistant Professor at Michigan Technological University and holds a Ph.D. in Acoustics from Pennsylvania State University and a MS and BS in Mechanical Engineering from Michigan Technological University. Mr. Thibeault has an MBA and Master of Science in Acoustics from Pennsylvania State University and a Bachelor of Science degree in Physics from Ursinus College. For additional information please visit the PCB® training page, www.pcb.com/Training or contact Tina McKean at (800) 828-8840, x-2672 or tmckean@pcb.com. PCB Piezotronics Inc. is a designer and manufacturer of microphones, vibration, pressure, force, torque, load, and strain sensors, as well as the pioneer of ICP® technology.This instrumentation is used by design engineers and predictive maintenance professionals worldwide for test, measurement, monitoring, and control requirements in automotive, aerospace, industrial, R&D, military, educational, commercial, OEM applications, and more. Our Platinum Stock Sensors program ensures same day shipment of over 10,000 sensors that are covered by lifetime warranty. With a worldwide support team of Field Sales, Application Engineers, and Customer Service Representatives, PCB® proudly stands behind their products with the services you value most, including a 24-hour SensorLineSM a global distribution network, and the industry's only commitment to Total Customer Satisfaction. Visit www.pcb.com for more information. -Acoustic measurement | -Acoustic parameters | All articles | PCB Piezotronics, Inc.